FOIMan asks why there is an FOI Commission when there isn’t, say, a PR Commission. After months of silence, the FOI Commission established in July has finally issued a consultation document. As the Campaign for Freedom of Information has commented, its content strongly suggests a desire to fillet the FOI Act of all changes made at the insistence of Parliament in 1999/2000. It is looking at whether the Information Commissioner should be able to overturn decisions or just make recommendations, for example, and whether more exemptions should be made absolute. Scary stuff to anyone who believes that FOI fulfils an essential role in holding government to account. 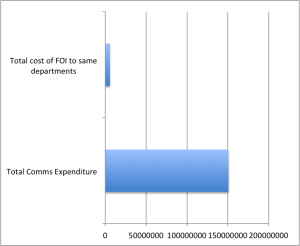 One area that the Commission is clearly examining is the cost of FOI. The report trots out all the figures that every inquiry has ever come up with – all of which have had questionable credibility. Government wants to cut cost of FOI – Government comes up with figures which show FOI to be as expensive as possible. It isn’t the first time, nor will it be the last time, that public officials have complained about the expense of FOI. And nobody seriously disputes that the administration of answering correspondence from the public, and in the case of FOI, locating information, costs money – occasionally a lot of money. However, it is the context that really matters. All activities carried out by public bodies cost money. Why should FOI be the one singled out by officials? Especially given the benefits it clearly delivers and its relatively inexpensive nature compared to other expenditure. FOI is just one way that government and citizen can interact. There are two primary differences between FOI and other government communications. The first is that it has statutory backing – public bodies have to answer requests (though if they think that removing such backing would stop people asking the questions, they may well be very disappointed). Secondly, it involves the public identifying specific things that they want to know – rather than officials deciding what they want the public to know. The question then is – why aren’t these other forms of communication receiving attention? How much do they cost? Back in July I submitted an FOI request to all the central government departments asking for just this. How much in total did they spend on communications in 2014/15? This was to include press office functions, external communications and marketing activities. Now I don’t actually make that many requests myself. My experience of FOI is primarily as a practitioner – answering the requests, not making them. Although I’m perhaps more sympathetic to those dealing with requests than most, I was still very disappointed by the performance of some departments in responding to what was a relatively straightforward request. I’m still waiting for a response from several of them 6 weeks after the deadline has passed. I’m going to write more about my experiences in making this request in a future post. Nonetheless, I now have enough data to provide a good indication of the answer to my question. 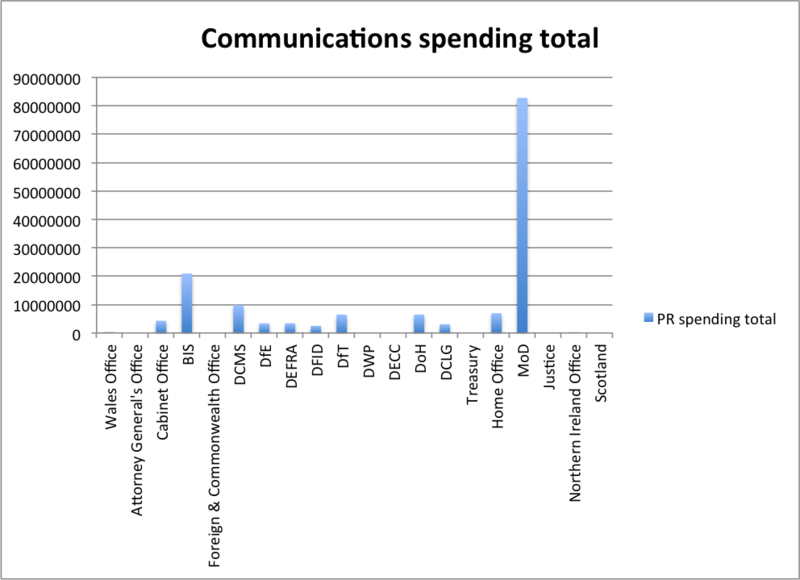 How much do government departments spend on communications? First, the caveats. The departments often didn’t hold the information in the form I asked for. They often provided the nearest useful figure – the expenditure by the Public Affairs directorate for example, which might well include matters not relevant to my question (although it is even more likely that it excludes some activities that we might well feel belong properly within these figures). It is possible that different departments interpreted what should be included differently. And many if not all of the figures provided included a wide range of communications activities including internal communications (which for a number of government departments, taken broadly, can be significant – consider for example how much the MoD spends on communicating with members of the armed forces). These figures are not going to be scientific. However, they do give us a strong indication of how much government spends on communications with the public, the Press, and its own employees. 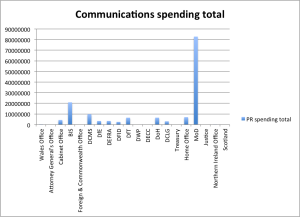 Bearing all of this in mind, take a look at this chart, which details how much each department spends on communications according to their responses to my request. You will see that significant sums were spent in 2014/15. In total, and excluding the departments that haven’t as yet provided figures, £150.7 million was spent on press, communications and marketing by central government departments in 2014/15. It is likely that the actual figure far exceeds this, given that some of the largest government departments have so far failed to respond. government’s published figures on FOI request volumes and multiplied these by the figure the Ministry of Justice’s own research suggested was the average cost of FOI requests in 2012. They’re not perfect – they don’t account for inflation since 2012 for a start – but they do give a realistic impression of the true cost of handling FOI requests. And compared to the cost of other communications – including what is popularly known as “spin” – FOI is not remotely expensive. Yet it is the cost of FOI which is attracting focussed attention from a specially established commission. I’ll publish the full data in due course for your interest, but for the time being I thought you’d be interested in the headline figures. I should also say that at this moment in time, I’m still waiting to hear from the Foreign & Commonwealth Office, the Ministry of Justice and the Department of Energy and Climate Change. Work and Pensions and the Treasury refused my request and I am waiting for the outcome of internal reviews. The assumption of Government is that policy could be affected by release of information, a very old and somewhat over-used term else why did the Government introduce the 20-year Rule for release of Government files (in theory), it is 15 years in Scotland. What has the Government got to hide?, Ministers and civil servants should be able to defend their actions even on long term projects like HS2, after all the files on Crossrail were released before they even started digging the ground, it took so long to get decisions to go ahead with the project. I don’t doubt that some requests are unnecessary (in my view) and are not really FOI requests but complaints but public bodies should be held to account the only question is at what date. If the information takes time to accumulate an answer then fine but if it is available then it shouldn’t be a problem. I am not surprised by the problems you have in getting a reply from the Treasury, the department has gone downhill recently in relation to their records management of their files, currently they are supposed to transfer over 37,000 files to The National Archives (TNA) by the end of December and another 24,000 next year and only 850 are available on TNA’s catalogue!. Kent Council is quoted in the consultation document complaining about increasing numbers of requests and a lack of resources. I worked at a paper in the area during the time period mentioned and remember them having a large and fairly useless press office, funny how they didn’t choose to divert some resources to their overburdened FOI team.